If needed, the user can change satellite name, local frequency, TP frequency, TP number(or channel name) directly in LCD screen. Signal level and actual SNR are displayed together in one screen and the measurement unit can be changed to dB or %. SR, FEC, BER are displayed in one screen. Max. 10 satellites or 300 transponders, signal polarity, TP number, CH name[provider], SR, FEC are preprogrammed. PEAK SIGNAL LEVEL DETECTION WITH AUDIBLE TONE FOR ALIGNING DISH. 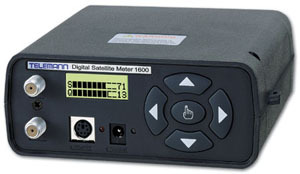 COMPUTER INTERFACE : Serial Port[COM1, 2, 3 or 4] for downloading a satellite file list. USER CAN DOWNLOAD & EDIT A SATELLITE FILE LIST BY USING. DiSEqC SWITCH COMMAND are available.